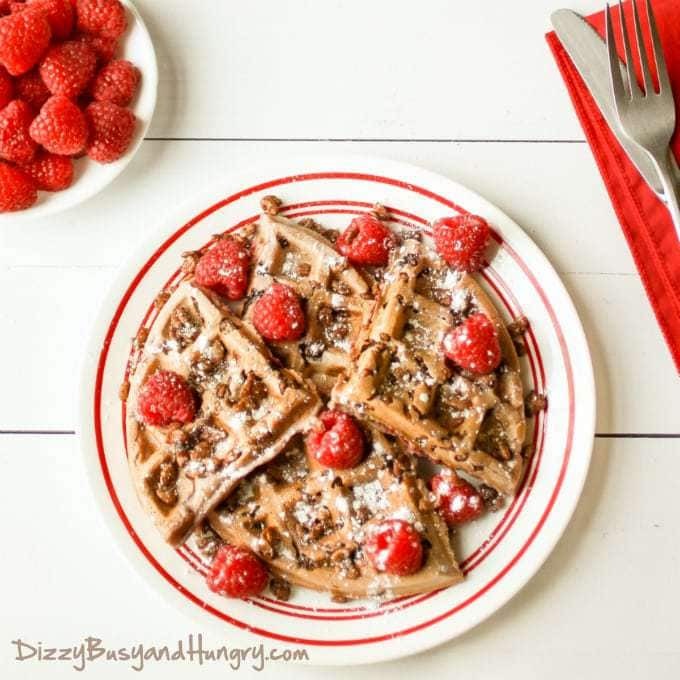 Chocolate Crunch Raspberry Waffles | Dizzy Busy and Hungry! Breakfast is the most important meal of the day. But that doesn’t meant that it can’t be fun, too! Thing 1 and Thing 2 simply love waffles. In truth, I don’t have to do anything fancy – they will be ecstatic that I am making waffles, even if they are just plain. But they were over the moon for this fun version! They loved it when I let them sprinkle the chocolate crispies on the waffle batter so that they could control the amount of crispy in their serving. As you can imagine, they added WAY more than I would, but a little excess is what makes this breakfast fun and special! 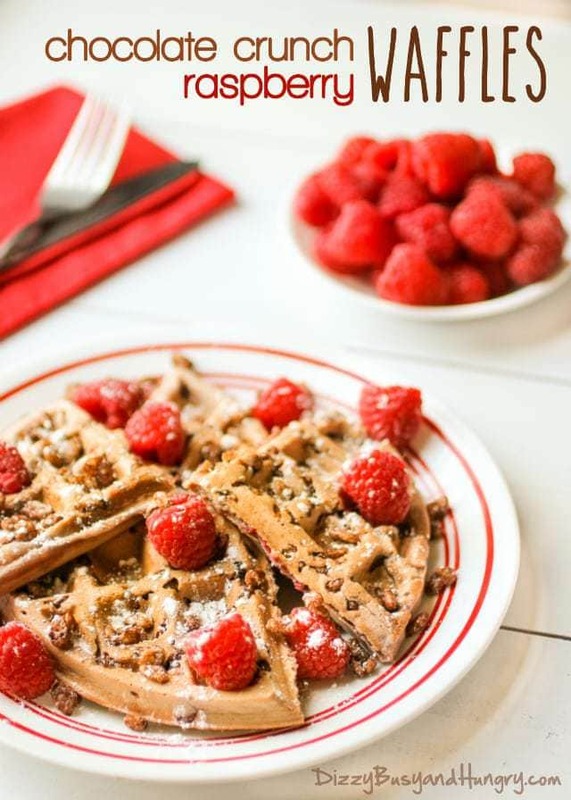 You can use fresh or frozen raspberries in the waffles. I tend to use the frozen because I keep a stash of them in the freezer to pull out whenever the mood strikes. But it is always nice to garnish with fresh raspberries on top when serving! Either way, these get gobbled up before I can even pour them a glass of orange juice or milk to go with it! 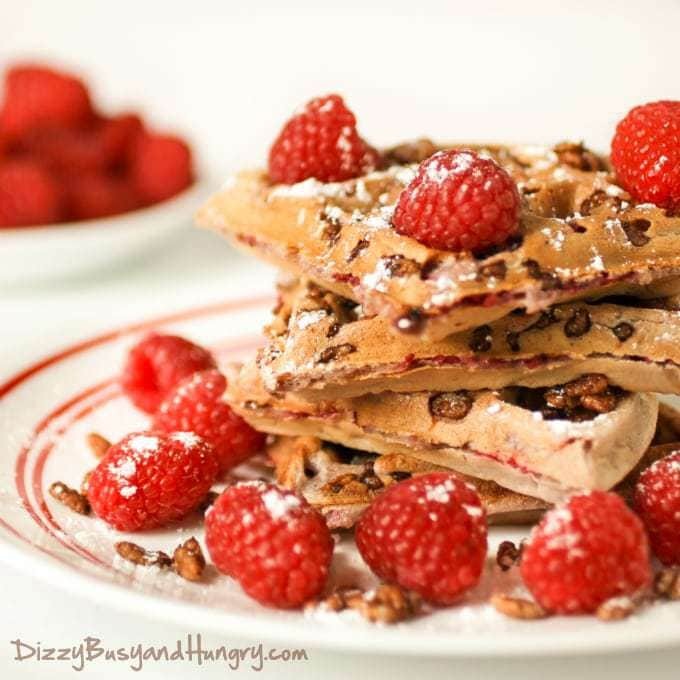 Chocolate Crunch Raspberry Waffles - Kids love these fun and delicious waffles with crunchy chocolate crispies and real raspberries! Preheat your waffle iron according to manufacturer instructions. Mix all ingredients except the raspberries and chocolate crispies together until fairly well combined. When waffle iron is ready, pour the amount of batter recommended for your waffle maker. Before closing the waffle iron, sprinkle about 2 tablespoons chocolate crispy rice cereal over the batter surface.You can customize with more or less than that, if desired. Cook until golden brown, then serve garnished with confectioner's sugar, extra crispies, and/or fresh raspberries (all optional). I can see why kids would love this! I’ll take mine with just the raspberries please. 🙂 Thanks for sharing with SYC. These look amazing and your photography is on point. YUM! Thanks for sharing at the To Grandma’s House We Go DIY, Crafts, Recipes and More Link Party! Pinned this! hope to see you again next week. How clever adding crunchy cereal to waffles, I’m going to try that! Thanks for the great recipes and for sharing at Fiesta Friday this week. I’m a little bit behind but I wanted to make sure to check out your post – and thank you for joining the What’s for dinner party. 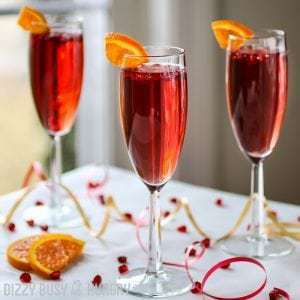 Have a wonderful weekend and hope to see you at tomorrow’s party too! These waffles sound so yummy! You had me at chocolate! Sharing !Thank you for sharing on Merry Monday! Hope to see ya next week! How fun are these waffles!?! Thank you for sharing at Snickerdoodle Create Bake Make. Phenomenal! I would just love these myself…and raspberries are my favorite fruit. Thanks so very much for sharing with us at Weekend Potluck. Please come back again soon. 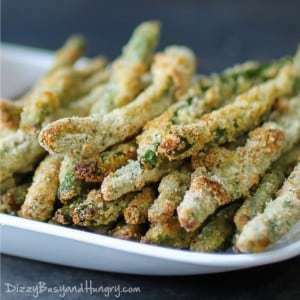 These look very delicious Kristen! Pinned and shared! Hope to see you on Saturday! Love the crunchy waffles, the boys will definitely love these. Thanks so much for sharing with Foodie Friends Friday party this weekend. Pinned/shared. 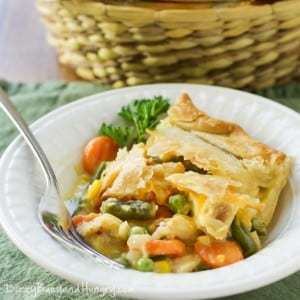 You always link up such great posts….this looks absolutely delicious! Thanks so much for sharing at Share The Wealth Sunday! These look amazing! Chocolate raspberry is my favorite! 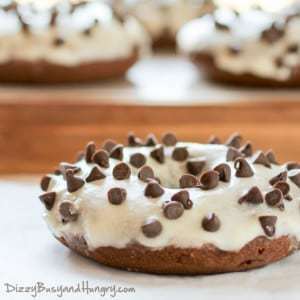 I will definitely have to try these for breakfast at my house. I’m already hungry! Yummy! Thanks so much Kristin. I have been meaning to mention how much I enjoy your photography. Your photos are beautiful, and it is a pleasure visiting your gallery. Awww thanks, Bernadette! That is so nice of you to say. You made my day! 🙂 Hope you are having a good weekend! I need to try making these with GF flour… I have been really into waffles lately! Let’s be honest, always – just not since the whole GF thing until I found really good ones and then decided to attempt making my own.